Michael McFadyen's Scuba Diving - Henry Head The history of Botany Bay goes back thousands, if not tens of thousands, of years. Prior to the visit by the first white men 1770, Botany Bay was already home to a number of Aboriginal tribes, Kameygal and Gweagal. One of reasons the Kooris thrived here was the abundance of marine life present in and around the Bay. Europeans were not to visit Botany Bay for another 18 years, but in January 1788 two separate European fleets visited the Bay within days of each other. The first to enter was the First Fleet under the command of Captain Arthur Phillip of the Royal Navy on 18 January 1788. He stayed until the morning of 26 January when he moved his fleet to Port Jackson, now better known as Sydney Harbour. Luckily for history, Laperouse had entrusted to Captain Phillip a copy of his logbook which is our only knowledge of that part of his trip until he came to Australia. Items of the equipment carried by the expedition and pieces of the ships can now be seen in the Laperouse Museum in the old Cable Station in the suburb of La Perouse on the Botany Bay shore. A replica of an anchor from L'Astrolobe is also on display at the Laperouse Monument and nearby is the grave of Pere Receveur, a Catholic priest who died on 17 February 1788 from injuries received earlier in the voyage. A visit to the Laperouse Museum is well worth a visit and I recommend it to all interested in the history of not only Australia, but the South Pacific in general. The Museum is run by the NSW National Parks and Wildlife Service and a small fee is charged for entry. Since the 1930s Botany Bay has suffered the building of Mascot Airport, the extension of its main runway twice, the 1990s construction of the third runway, the reclamation of all the northern shore for Port Botany and its facilities and the construction of two oil refineries/storage areas and numerous chemical plants. Somehow, it has still survived. At least in the 1990s we (scuba divers) saved the Bay from the effects ocean sandmining just off the entrance would have have on it. The outer northern headland of Botany Bay is Cape Banks, named after Sir Joseph Banks who was the first European to record the flora and fauna of New Holland or New South Wales as Cook was to later name it. The first inlet inside the Bay is Cruwee Cove, also known as Pussycat Bay and then there is a small point that does not, as far as I know, have a name. This leads in a gentle curve to Henry Head which was named by Cook after the then King whose name was, I think George Henry ....(? not sure about this as it does not appear in Cook's journals at all). Henry Head is, like Middle and South Heads in Sydney Harbour, the site of a conglomerate of tunnels, forts and gun emplacements. They were built in the 1880s to repel the expected Russian invasion. Of course, the Russians never came, but the legacy of their threat has left a fascinating impact on the history of Sydney. I grew up only a few hundred metres from here and my school friends and I spent almost our entire childhood playing in and around the tunnels and forts (my mother almost had a heart attack in the late 1990s when I told her of this!). The tunnels connecting the forts and emplacements (some very small) run for hundreds of metres, although many of the smaller ones are now filled in by shifting sands. The NSW National Parks and Wildlife Service used to run guided tours through the fortifications during the school holidays but it no longer appears to do them as the Liberal government in the mid 2010s has totally disseminated the staffing and funding. I can recommend these tours as a great way to learn more about our cultural history if they ever resume. The waters off Henry Head are, in the right conditions, a fantastic dive location. The water depth ranges from 12 metres nearer the shore down to approximately 27 metres towards the main shipping channel. Large boulders litter the sandy bottom while ledges, overhangs and swim-throughs abound together with dozens of abandoned anchors from small craft. Fishlife includes groper, yellowtail, bream, cuttlefish, old wife, mado, red morwong and magpie morwong. Sponges and sea squirts of many colours can be found all over, some of the best I have seen anywhere in Sydney. As well, there are a couple of rarer species to be seen. The common sea dragon (which did not use to be all that common in Botany Bay but from the mid-1990s for about 10 years was almost in plague proportions) can be found quite easily on the sandy bottom off Henry Head. 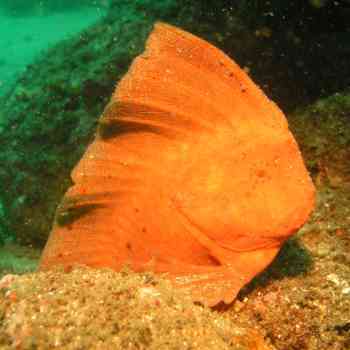 In addition, red indianfish are found in the same area. You will have to look carefully to find them but they are nearly always to be found. This dive can either be done as an anchored dive or as a drift dive. If anchoring, line up with the large concrete section on the cliff face and run in using your depth sounder. The GPS spot of S34° 00' 04.4" E151° 14' 11.0" (using AUS66 as a datum - read my GPS Page if you do not know what this means) will put you in a good spot. When the depth comes up indicating a wall, drop anchor. The alternative is to drift dive on an incoming tide, more about this in a couple of paragraphs. You do not need to be too accurate, you can anchor anywhere off the point. If you are anchored on the top of the reef (10 metres), drop over the wall (to 15-17 metres) and head right to the reef edge. The depth here will be 23 metres (it gets to 27 metres to the east and out a bit). Follow the reef edge to the west, past the isolated boulders that you will see either on the edge or a bit off it. The rocks here are covered with a prolific cover of sponges, sea squirts, ascidians, gorgonias and other fixed life. This is very colourful. Look under all the small overhangs for interesting fish. You may see eastern blue devilfish and are certain to see cuttlefish all over. 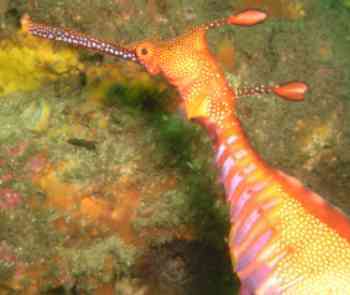 In between the boulders, look for common sea dragons, there are many to see normally. The reef starts to turn to the north and the depth starts to get shallower, coming up to 18 metres. By this time it will have taken you 22 minutes or more. This is a good spot to turn around. Come up shallower and follow the wall here (there are a number of walls at different depths) back to the south and then east. There are some very good overhangs and even some swim-throughs along here. This will eventually bring you back to the anchor area. You will probably still have some time so head past the anchor and explore this area a bit. If you start to run short of bottom time, come up into the shallower waters. For a drift dive, the ideal time to enter the water would be 60 to 90 minutes before high tide. The starting spot is the small point to the ocean side of the concrete section referred to above. Run in towards the small point from the south and when your depth sounder shows the reef edge, drop your divers off. They then follow the reef in towards Bare Island. The divers should not get much further than just inside Henry Head as they will either run low on air or available bottom time. This dive can be done in most conditions. It is especially good in north-easterly winds when it is very protected. However, big southerly seas and winds will make this site undiveable, try Inscription Point on the southern side of Botany Bay. This spot is especially suited to summer afternoons when there may be strong onshore sea breezes.